The mission of CELLSCRIPT™ is to provide the best products and technologies for making and using RNA for translation in cells for clinical research and therapeutics. 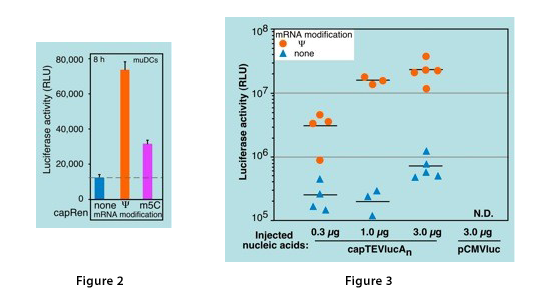 Current products include kits for in vitro transcription, 5' RNA capping using either a cap analog or capping enzymes, and 3' RNA polyadenylation, as well as all-in-one kits for making capped, poly(A)-tailed mRNA for translation in cells. 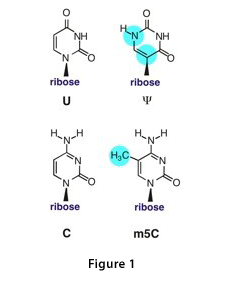 CELLSCRIPT™ recently introduced INCOGNITO™ RNA Transcription Kits for in vitro synthesis of RNA that contains modified nucleosides, such as pseudouridine (Ψ) and/or 5-methylcytidine (m5C) in place of the corresponding U or C canonical nucleosides (Figure 1). These kits are so-named because the capped, polyadenylated and nucleoside-modified RNA products (called "INCOGNITO mRNAs") are disguised so they do not induce innate immune responses to the same extent as the corresponding unmodified mRNAs when transfected into mammalian cells that express a variety of RNA sensors. The delivery of protein-encoding INCOGNITO mRNA to cells in culture or in vivo to an organism has the potential to produce a therapeutic effect by compensating for a missing or defective protein, overexpressing a desired protein, inducing a change in cellular phenotype, or triggering a disease-specific immune response. Thus, we believe INCOGNITO mRNAs will have many uses in regenerative medicine, such as for: cell reprogramming; cell therapies; cell, tissue or organ transplantation or repair; tissue or organ engineering; enzyme replacement therapies; and immunotherapies or immunomodulation therapies. Contact CELLSCRIPT™ to discuss kits for making research or therapeutic grades of INCOGNITO mRNA or unmodified RNA, or possible custom manufacturing of an appropriate grade and scale of RNA for your project. Warren L, Manos PD, Ahfeldt T, Loh YH, Li H, Lau F, Ebina W, Mandal PK, Smith ZD, Meissner A, Daley GQ, Brack AS, Collins JJ, Cowan C, Schlaeger TM, Rossi DJ. Cell Stem Cell. 7(5): 549–50, 2010. © 2011 CELLSCRIPT™ All rights reserved.